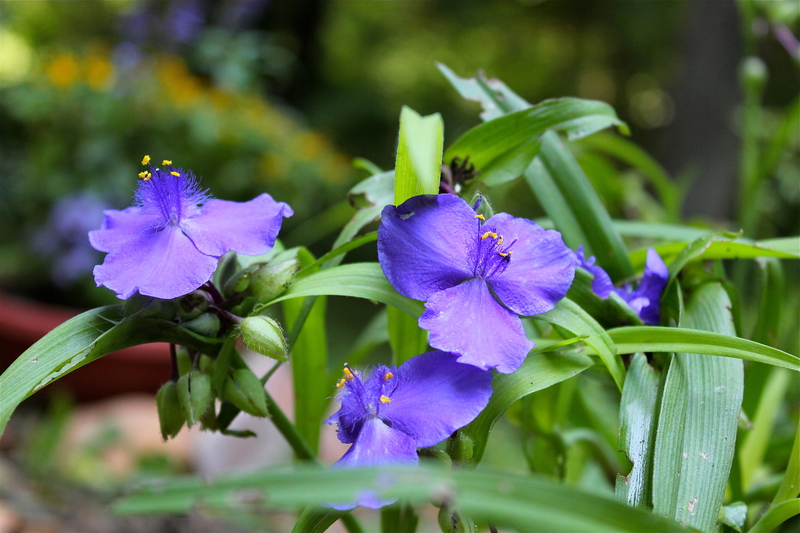 Found in almost all counties of Virginia, spiderwort is both a native wildflower and a commonly cultivated garden plant. The plants get about two feet tall can be found singly, but most often occur in large clumps that look like tall, wild grass. The flowers bloom at the top of the stems and arise a few at a time from round clusters of buds. See the images below. The flowers of spiderwort last only one day, typically opening when the sun hits them and then staying open for just a few hours. The next day new flowers open. The flower consists of three petals, which can be blue, purple, pink or white, but most commonly blue. There are six yellow anthers that are quite evident; the stamens are hairy, and on some cultivars the stamens are the showiest part of the flower. Bloom time is May-June: this is a cool-season plant that does well in moist soil and partial shade. Spiderwort goes semi-dormant during the heat of summer.